When I returned the new Suzuki 750 GT to Hazell & Moore's showroom I was asked 'when did you ever ride a better bike?' And do you know I couldn't think, and I don't think I have. Have Suzuki made the best Japanese motorcycle yet? I think so. I became a late believer on the altar of the Honda four but my conversion to the Suzuki took about 4 hours and a hundred miles. It is in a word -fabulous! I am quite prepared to conceed that the Honda 4 is probably faster and I am also prepared to conceed that the new 750 Kawa- saki will be faster but for a bik'e to ride all day every day the 750 GT must be close to the best. It is fast, it handles well, it brakes well and it is almost dead silent. No longer is the Bee Emm the quietest two wheeler. When the time came for me to head the bike for home, the temptation to turn it in the opposite direction and head for Brisbane was very strong. It is that kind of a bike, you don't want to'get off it. Not having had the opportunity of riding an MV or a Munch Mammoth or a Laverda or a new BMW if it comes to that I must go on record as saying that the Suzuki is the most pleasant long distance sports tourer that I have ever ridden. Some months ago I described the Suzuki Titan as being a 'bargain basement superbike' - there is nothing bargain basement about the 750. It has the muscle and the class to slug it out with the best of them. For some reason Suzuki seem to delight in pulling surprises in the engineering department. 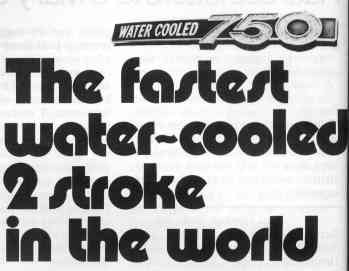 First they produced the 'it couldn't be done' 500 twin two-stroke and now they have gone the full way and given the world the first production water cooled two- stroke since before World War II. 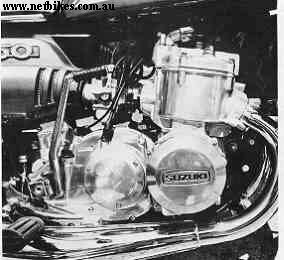 And what a power plant, 738cc (another thing Suzuki delight in odd-ball engine capacities) from a 70mm bore x 64mm stroke and a claimed power output of 67bhp at 6,500 rpm. The cooling system is via a very normal looking car type system with an electric fan for use in heavy traffic (I never had any use for it, the temperature never moved off the normal position the whole time I had the bike). Drive is through the usual five-speed gearbox and in fact except for the engine every thing is completely conventional, except for the front brake which is a four leading shoe drum unit. At a time when every one else is switching to the disc brake, Suzuki have come forth in support of the expensive 41 s arrange ment which is fitted to all the top racing bikes world wide. The GT750 is a big machine and weighs in at a claimed 472 pounds but I'd have to see it on a weighbridge to believe it - it feels much heavier, not that the weight is especially noticeable as the whole thing is very well balanced. Suzuki have also fitted an electric starter to the bike - in fact Australian distributors didn't know the bike was so fitted until they had a look at it in Sydney - which says something about the factory's sense of priorities. speeds that on another bike would have been insane. 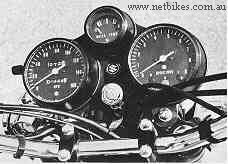 On the 750 GT it was merely the cruising speed. Cruising speed is what you make it - I was sitting between 70 and 100 along this 40 mile de-restricted length of road in perfect safety. The Department of Main Roads has posted advisory speed signs on many of the corners, the highest 45mph and most around 40. The big Suzuki never dropped below 70 and most times sat around 75/80 with the ton coming up on any short straight. And this without dropping out of top ! Maximum speeds through the gears indicated on the fairly accurate speedo were first 40mph, 2rid 60, 3rd 80, with the ton coming up in fourth and God alone knows what in fifth - I would think that another 20 miles an hour would be possible without too much of a run up. I didn't have any straight that long. Appearances are deceiving and in the case of the GT 750s petrol tank this is very true. It seems to have a large capacity but much of it is given over to water pipes and the like and the capacity is 4 gallons which is fine for about 200 miles. When I first saw the Suzuki described as the 750 GT I raised my eyebrow a little asthis isa term thought up by the Italian car boys (the Falcon doesn't really fit and none of the other locals do) to describe a car for long distance, high speed touring - things like Ferraris and Aston Martins and other exotica - for two people and a minimum of luggage. Riding it the Suzuki qualifies on all counts - it has enormous performance of the no-fuss kind, it will carry two people and a minimbm of luggage (like: what they're wearing) - and it is ideal for high speed interstate tours. A superb high speed tourer the Suzuki is, a lightweigh't boy racer it ain't. On open highway where the bends are open and the roads at least two lanes wide the Suzuki is in its element but take a tight one lane mountain hil'l climb with lots of tight s-bends and the one handling fault shows up - it is not the suspension that is at fault -- the blighter is just too big. And at low speeds heeled over the bike feels as if it wants to fall out. It doesn't but itwas the only situation in which I did not feel confident. At all other times the bike's behaviour is impeccable. Possibly the only other serious handling fault can be attributed to the tyres that the bike runs as standard equipment. Made by Bridge stone they lack grip in certain situations and the rear wheel slides out, gently and controllably but if the bike were fitted with Dunlop K81s Or the Avon/Dunlop combination that the Castrol Honda 4 had when I rode it a month or so ago all would be fine. Thumping the bike down a gear with the speed a little too high will cause the back wheel to dance but again this is control- lableand not really very exciting. Which brings me to my one point of contention with the GTs handling. The brakes. Stopping power is very good, but generally the brakes lack feel and especially the back unit. It is too hard to judge the lock-up point with the back unit and if I owned this bike I would spend quite a bit of time fiddling with the back anchor until I got this right. The bike is too fast to muck around. Stopping power is very good, the brakes will haul the bike down from a hundred miles an hour to forty like the proverbial giant hand. They are good but more feel please. It appears that, looking at the bike, the Suzuki 750 GT is fitted with a primitive device known as a kickstarter. I had no occasion to use it and indeed was not even curious enough to give it a test kick. The electric unit is more than adequate. A light touch on the button and the bike is running - no fuss and less bother. Every time, hot or cold. I am tempted as I did a few months ago with the first Honda 4 to say adequate, and it is, but this is not the whole story. Unlike the Honda 4 (which is the nearest direct comparison) which has a beautiful gutsy four-stroke exhaust sound the GT is quiet and it is smooth. When I spoke with a Suzuki factory representative in Sydney recently he claimed that it was smoother than the Honda. I have to disagree, the Honda is incredibly smooth throughout the rev range. By comparison the GT 750 is rough until it gets to 3,000 rpm, then the Honda 4 seems like a misbegotten end ufo single. The incredibly strong mid-range torque of the water-cooled three really makes itself felt areund 3 and the bike smooths out to an unbelievable degree. Coupled to the lack of noise this is one of the things that makes the GT such a pleasant tourer. Wrapping the throttle open at around 70 miles per hour in fifth, results in more action than I would have thought possible and the speedo needle is in the three figures in a very short time. I found for passing that it was almost unnecessary to drop down a cog as at 70 the engine is pretty well in the top half of its torque curve and acceleration is very good. I have no idea what drag strip style acceleration times might be as I think they are unimportant to a road bike (how many times do you do a 0 to 100 in a day?) but burning off from a stop is also a no-fuss deal. 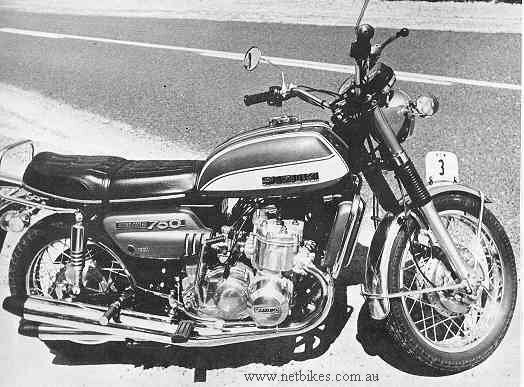 Unlike the Kawasaki Mach III the GT 750 has no tendency to lift its front wheel at all and the sense of speed is less than on the Kawa. Perhaps this is one of the bikes' outstanding points the lack of speed sense. It is rather like one of those great upholstered lounge rooms that the Yanks call cars, nothing is allowed to intrude, if at any time I found that I was going into a corner over my head it was because the speed was at least 10 to 15mph more than I expected it to be. Not that it mattered, I didn't have one anxious moment while I had the big Suzuki. Often it takes a few miles or a couple of hundred to feel at home on a bike, especially a large capacity one, but it took exactly 1.6 miles on the GT because I remember consciously thinking that 'I'm going to enjoy this ride', and I did. There is no argument that the GT 750 is an impressive looking machine but there has been a bit of a fight about whether or not we like the looks. I do, although I don't like the amount of chrome splattered all over it. Roy Bisson does but he doesn't like the tank shape. Lindsay Hannington doesn't like it at all but that's because he wasn't allowed to ride it, having bent a 250 Savage severely out of shape a couple of months ago. The actual quality of the finish seems to be up to Suzuki's usual high quality. So .far the examples of the bike that have come into Australia have been either turquoise and white or a sort of a mauve/purple and white, neither of which are my favourite colours but considering the number of other models that Suzuki have been selling it seems that someone must like them. Considering the wrap up that I have given almost every other aspect of the bike you would probably expect me to follow suit here. Sorry lads, it isn't as comfortable as it looks. 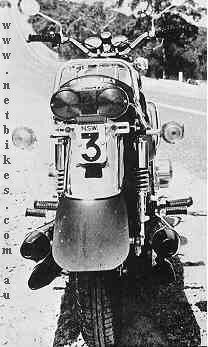 Even allowing a concession or two because the suspension was set on the firm side, the ride is not brilliant and much of the road shock is transmitted directly to the rider's bum. I spent a fair bit of my time on a badly surfaced road in the air. The firm seat doesn't help either. It is plenty long enough for two but it is too hard. I know that the likes of Agostini (i.e. Italian) likes a firm seat but I don't. And furthermore for a Japanese machine the clutch lever is on the heavy side, but the handlebars are beaut. Mainly the comfort angle, nothing else bothered me. Except that it costs $1,495.00 and I can't afford it. Suzuki's best bike yet and I think that they deserve to self a lot of them. They were the last into the superbike field and from what their factory man told me they entered the field most reluctantly, but they have done a superb job first time out. And they have been aware of some of the smaller faults, like too low exhaust pipes which they have already corrected with the sales shipments coming through now. I rate it as the best Japanese bike so far. It does its job so effortlessly and in a manner which would have other bikes scratching to keep up. I don't know whether or not it is a potential Castrol 1000 winner, but I do know that it is a road bike in a class by itself.